You won’t get a full blown orchestrated container runtime for your microservices architecture. For only a few services the setup can work. If not, migrating to another environment, later on, is straightforward, as we are using Docker. Below is an overview of the infrastructure we will set up. docker build -t azure-docker-blog . Wait for the success message in the upper right corner. Then click ‘Go to resource’. 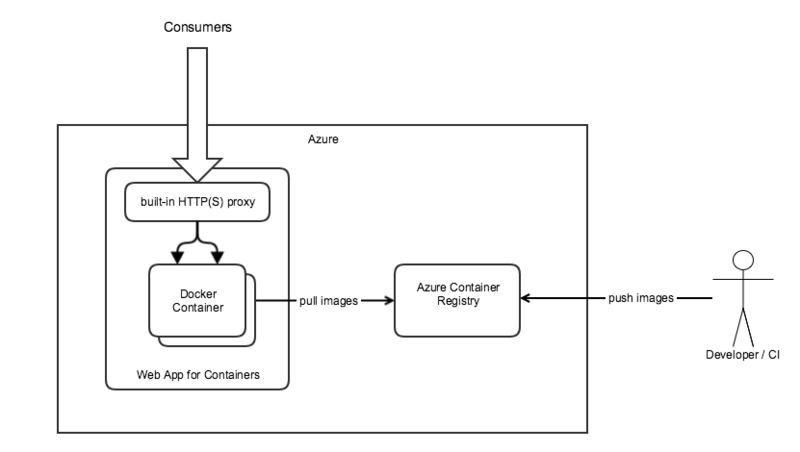 docker build -t azuredockerblogregistry.azurecr.io/azure-docker-blog . Now we will enable automatic pull of new images. On the portal site open the settings for your App Service and there enable ‘Continuous Deployment‘ under the section ‘Container settings’. Whenever we push a new version of our image, the App Service will now be notified and replace the existing version. you should now see “Hello docker! Server started: …”. With ‘curl https://azure-docker-blog-app.azurewebsites.net/shutdown‘ you can kill the NodeJS process. In this case, it will be restarted automatically. We now have our app running and can push new versions by simply doing docker build + push. What runs inside the container is up to you. You are not restricted to NodeJS, but you can use anything that runs inside a Linux Docker container. Use your favourite JVM language or go with Haskell, if you like. Just expose your service via HTTP on port 80 and you’re ready to go.